An EgyptAir flight reported missing between Paris and Cairo has crashed, French President Francois Hollande confirmed. The Airbus A320 with 66 people on board disappeared from radar at 02:30 Cairo time (00:30 GMT), soon after leaving Greek airspace. Greece’s defence minister says Flight MS804 made “sharp turns” and plunged before dropping off the radar. A major search is under way in seas south of the Greek island of Karpathos. Greek and Egyptian armed forces are involved in the effort, and France has offered to send boats and planes. Mr Hollande said he was keeping an open mind about the cause of the crash. “We will draw conclusions when we have the truth about what happened,” he said. There were 56 passengers – including three children – seven crew members and three security personnel on board. They included 30 Egyptians, 15 French citizens and a Briton. 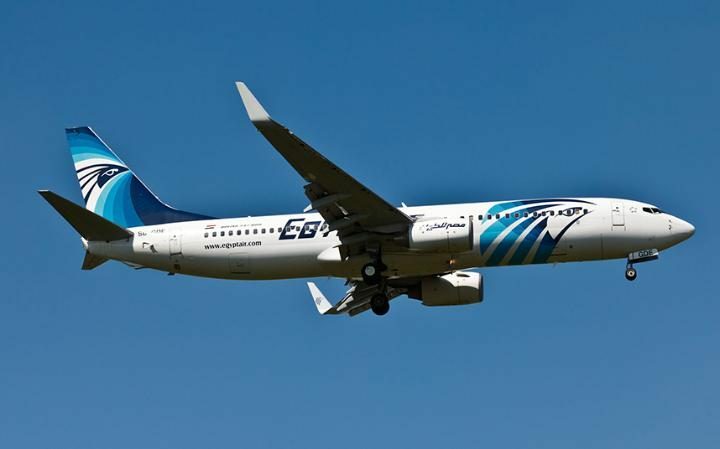 Flight MS804 left Charles de Gaulle airport in Paris at 23:09 local time on Wednesday (21:09 GMT) and was scheduled to arrive in the Egyptian capital soon after 03:15 local time on Thursday. EgyptAir said the plane had been flying at 11,300m (37,000ft) when it disappeared from radar shortly after entering Egyptian airspace. Aviation officials in Greece said earlier that air traffic controllers had spoken to the pilot a few minutes earlier and everything had appeared normal. But Greece’s Defence Minister Panos Kammenos told a news conference that soon after entering Egyptian airspace, the plane had turned “90 degrees left and 360 degrees to the right” before plunging. There was some earlier confusion over whether a distress signal had been sent by the plane. Egypt’s state-run newspaper al-Ahram quoted an EgyptAir statement as saying the Egyptian army’s rescue and search had received a distress call from the plane at 04:26 local time – which would be around two hours after the flight disappeared. But Egypt’s military subsequently said that no such signal had been received. The spectre of terrorism inevitably looms over this latest aviation tragedy. While there is no evidence yet to indicate a malicious attack, it was only seven months ago that the Islamic State (IS) group planted a bomb that brought down a Russian passenger jet over the Sinai. IS have vowed to continue targeting the Egyptian state and westerners who visit Egypt. In a different but also malicious incident in 1999 a disturbed EgyptAir co-pilot put a Boeing passenger plane into a fatal dive off the US coast killing all 217 people onboard, though the Egyptian government continues to say it was a mechanical failure. However at this stage investigators will be keeping an open mind about the cause of the plane’s disappearance, including checking the maintenance record of the airframe. Some of the relatives of those on board gathered at airports in Cairo and Paris to wait for news. Mr Hollande had earlier spoken to his Egyptian counterpart and both leaders were holding emergency meetings with their top officials, according to reports from both countries. 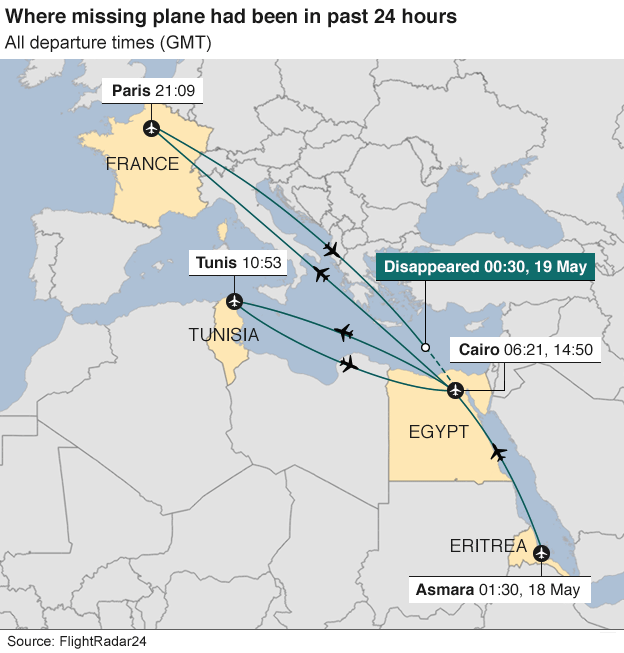 Flightradar24 listed details of the plane’s journey on Wednesday which showed it had flown from Asmara, in Eritrea, to Cairo, then on to Tunis, in Tunisia, before heading, via Cairo, to Paris. Aviation analyst Alex Macheras said that Airbus A320s were regularly used for short-haul budget flights and had “an amazing safety record”. In March, an EgyptAir plane was hijacked and diverted to Cyprus. The attacker later surrendered and all hostages were released. If anyone is concerned about relatives or friends following the disappearance of the flight, they can call this free number provided by EgyptAir: +202 259 89320.